Satori Poch is nationally certified in both Acupuncture and Chinese Herbal Medicine by the National Certification Commission for Acupuncture and Oriental Medicine (NCCAOM) and is licensed by the Virginia Board of Medicine. In San Francisco, California she worked in various hospital and clinical settings that included the California Pacific Medical Center for Stroke Rehabilitation Center, American College of Traditional Chinese Medicine Community Clinic and the local Auricular Community Clinic. She also completed the Advanced Clinical Internship Program at Zhejiang Medical University's hospitals and clinics in Hangzhou, China with rotations in Traditional Chinese Medicine (TCM) internal medicine, dermatology, gynecology, acupuncture and Tui Na (Chinese medical massage) departments. She received her post-graduate degree from the American College of Traditional Medicine and her Bachelor of Science degree from the College of William and Mary. A native to Richmond, Virginia, Satori lives here with her husband, two sons and loving dog, Mochi. 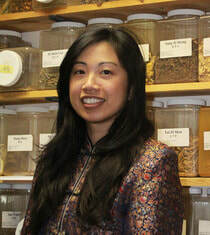 Her passion is helping people, families and communities achieve happy, healthy and balanced lives through Chinese Medicine.